Blights Out For Mayor Kickstarter. A year-long campaign that hacks the aesthetics of elections to expand the public political imaginary around land, housing, and debt. Why is our public visioning space taken up by ads for crank lawyers, liquor, guns, and politicians without platforms? While your political candidates might not have anything to say about the state of ecology, affordable housing, gentrification, and debt in New Orleans and across our nation, WE DO! We are occupying billboard space on the corner of Orleans Avenue and Galvez Street in New Orleans’ 6th Ward starting on September 4th in advance of the New Orleans Mayoral Election on October 14th. For one full year after, a fresh platform point will crop up once monthly, keeping public conversation popping… Because politics and policy neither begin nor end at the ballot. 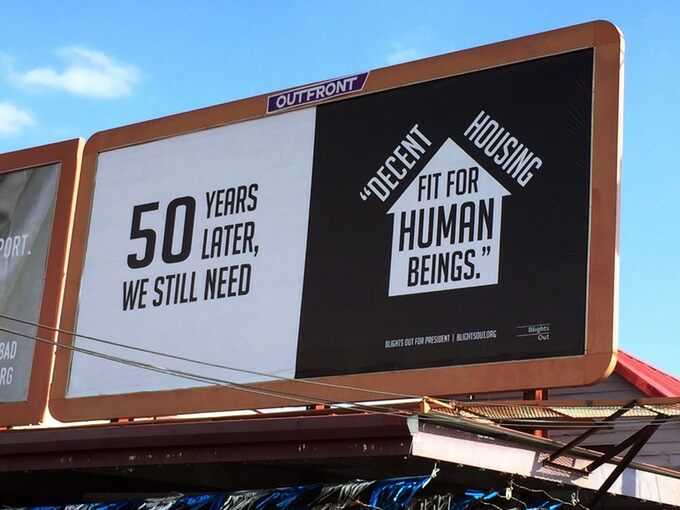 Our messages will draw from conversations we’ve had with folks from the housing justice movement, our own research into how the system of development works (or doesn’t work), and our Living Glossary project. Each billboard will seed the public’s mind to receive the next message. Our preliminary billboard goes up in time with the Kickstarter so you can get a taste for things to come. With your support, we can reserve our billboard location for one full year and cover the costs of producing the billboard posters and yard signs. Blights Out, Theater of the Gentrified Presents: “Auction”, from the Living Glossary series (feat. Mariama Eversley), 2017. Blights Out, “1731 Dumaine”, 2016. 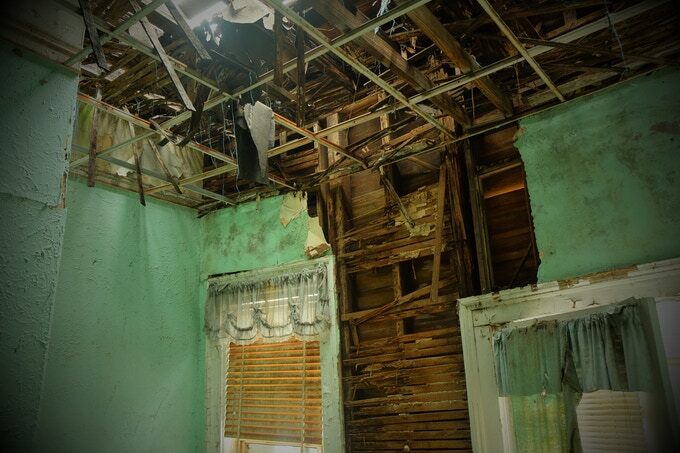 Once 1731 Dumaine’s roof caved in, demolition became inevitable. It is a stand-in for all of the lost former homes that were condemned to demolition-by-neglect. Climate change is real. It is here. Yet our politicians are not acknowledging the major changes that we must make to save our cities from a future of ecological apartheid. Across the world, wealth and power are reorganizing cities in their own image. After decades of disinvestment in urban centers, real estate developers have set their sites on the “inner city”, recognizing the immense profit to be made by converting disinvested neighborhoods into luxury developments. The phenomenon of gentrification is impacting cities across the US from New Orleans to Detroit, New York to San Francisco. 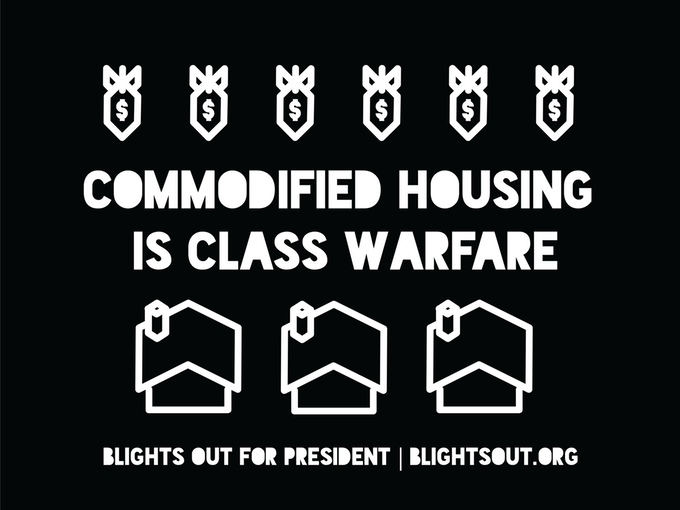 Blights Out, Commodified Housing is Class Warfare (Blights Out for President), 2016. Gentrification is a product of end-game free market capitalism run rampant. Racist/classist policy, capitalist values and climate change are coming to a head. We must ask ourselves: will the future of our cities be gentrified fortresses that protect the wealthy from the rising-up of seas and people? We all must unite to demystify the forces behind this phenomenon and push ourselves, the public, and our representatives to act now to create permanently affordable housing, preserve local culture, and build sustainable communities for all. While this project will be rooted in New Orleans, its strategies, messages, significance, and impact will resonate everywhere. Blights Out, “803 Spain (Faces of Gentrification series)”, 2017. 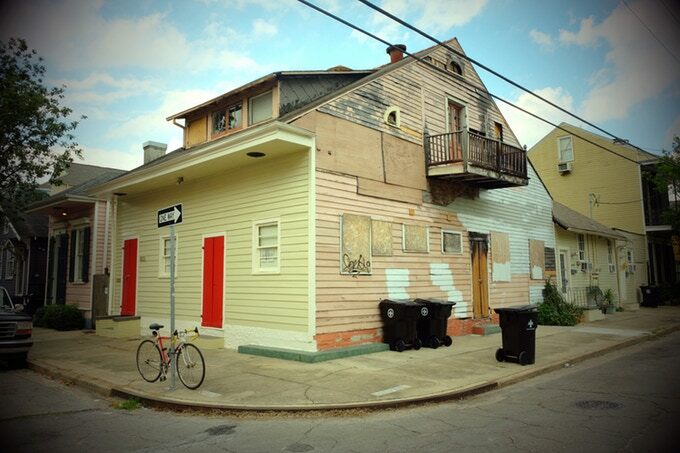 A blighted house in Marigny is repaired just enough to allow it to be photographed for market. We recognize that the values that have created bad housing policy in New Orleans are the same values that are destabilizing cities across our nation. US property laws are based on a justification for the displacement of Native Americans. Gentrification is a national crisis of values and is the natural end of our society’s refusal to redress our nation’s founding values and laws, which justified the displacement, mass murder and enslavement of indigenous and Black people. 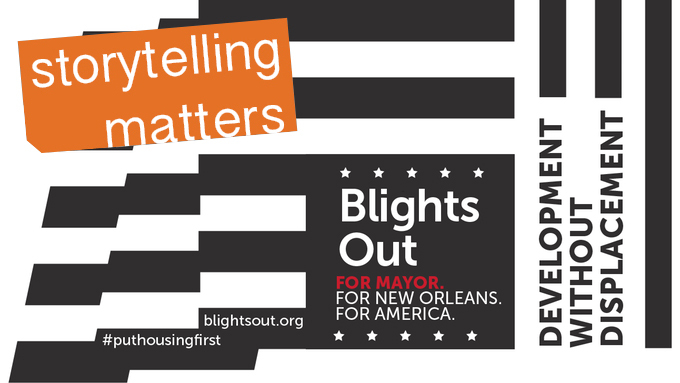 Blights Out is coming to Kickstarter to fundraise for this new project because we want to unite people in New Orleans and across our nation in a call to expose the roots of gentrification, address inequitable development as the root of systemic poverty and the expression of institutional racism, and declare that housing is a human right. Blights Out is a collective of artists, activists, architects, and concerned members of the public who seek to demystify and democratize the system of housing development and expose the policies that lead to gentrification. We have located the lynchpin of gentrification in laws governing debt and property, racialized boundaries, and wealth stratification. 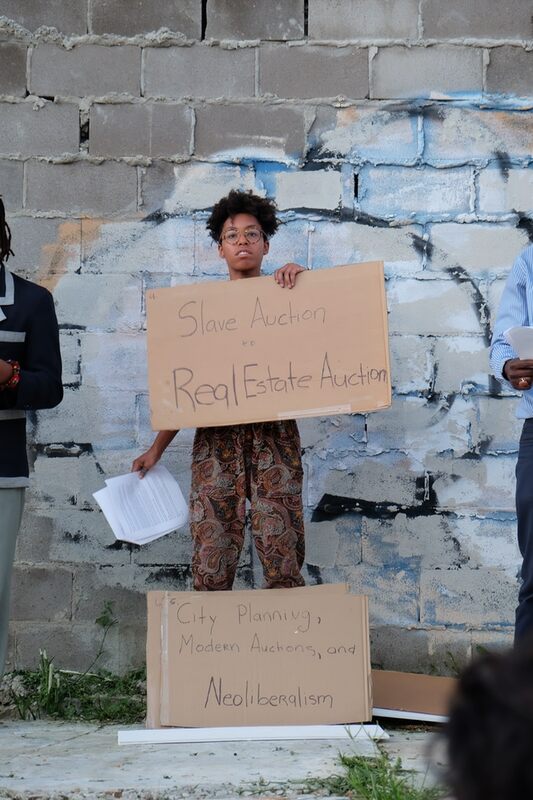 Our mission is to generate dialogue, art, and action that expose the policies that create blight, destabilize neighborhoods, and lead to gentrification. We believe that art can envision, embody, and inspire better policy for people and the planet. Blights Out was founded by native New Orleans artist/activist Imani Jacqueline Brown, native New Orleans artist Carl Joe Williams, and New York-based artist Lisa Sigal and is organized with Founding Architectural Designer Bryan C. Lee, Jr., Embedded Historian Mariama Eversley, and Cartographer Ron Morrison. Our strength is in our diversity of interests and backgrounds, so we invite you to join this dynamic network of people and ideas!